Non slip flooring is a necessity for many businesses nowadays. Reasons such as health and safety regulations; the requirements demanded of businesses by the DDA (Disability Discrimination Act); and building regulations, and more importantly, slip prevention for your employees, guests or customers. Why use Fabufacture’s anti slip grip surface? Our non-slip floor covering combines ease of application, durability and permanence to provide instant non slip protection at a competitive price. The 150mm x 610mm cleats are used throughout industry to provide both a visual alert and an anti-slip surface. 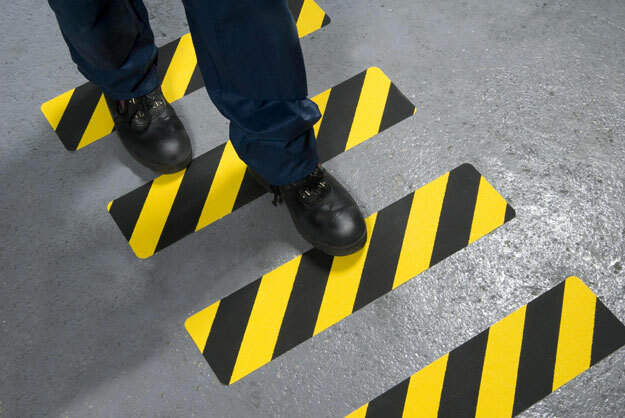 They are perfectly suited for stair treads, factory and warehouse floors, entrances and machine steps and anywhere an anti-slip surface is required. They can be applied onto most surfaces and will instantly provide high quality, anti-slip protection that meets safety standards throughout the world. Thanks to their simplicity that are also simple to install. This product can be applied onto any surface that is clean, dry and free from any grease.